This is a wrongful death case filed against defendant doctors in Charles County for failing to diagnose and treat ovarian cancer. It was filed in Health Claims Arbitration on May 4th, 2017 and it is the 209th medical malpractice case filed in 2017 in Maryland. A woman underwent surgery for an abdominal pelvic mass, including an exploratory laparotomy, total abdominal hysterectomy, bilateral salpingo-oophorectomy, left ureterolysis, bilateral pelvic lymphadenectomy, and periaortic nod evaluation. After the surgery, the woman was found to be suffering from stage 2B Clear Cell Carcinoma ovarian cancer. In order to address malignancies and metastatic disease, the woman was referred for chemotherapy and other medical treatment. In the months following her postoperative visit, the woman had a total of three CT scans at Tower Radiology. 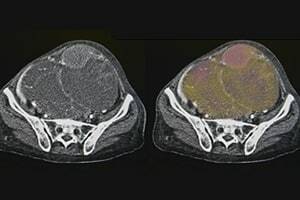 The first scan showed no sign of metastatic disease. After reviewing the second scan, the defendant doctor determined that, again, there was no sign of metastatic disease, and that the film appeared similar to the first scan. The woman, complaining of abdominal pain, came back for a third scan. The defendant doctor found the third scan unchanged from the second. Continuing to suffer from abdominal pain, the woman went to a local urgent care facility. The woman was given an x-ray and recommended to return to her oncologist. One week after her visit to urgent care, it was discovered that the 2.8 cm structure in the woman's right pelvis, visible during her three CT scans, had been mistaken for an ovary. Because the woman's ovaries had been removed during her bilateral salpingo-oophorectomy surgery, it was determined that the structure actually represented a metastatic lymph node. The defendant doctor reconsidered the woman's second and third CT scans, and then decided that the second scan had shown signs of metastatic disease after all, in addition to "hypodensities" in the pelvis which she had previously classified as unopacitied loops of bowel. The defendant doctor also indicated that the woman had a history of bilateral nephrectomy, even though the woman never had her kidneys removed. After receiving accurate reports from her CT scans, the woman underwent continued and aggressive chemotherapy and other treatments. Despite the medical treatment, the woman died of ovarian cancer eight months later. If the woman had been treated earlier for her ovarian cancer and metastatic disease, which had been clearly identified on CT scans two and three, she may have been able to live longer. Doctors reviewing films from CT scans should be familiar with a patient's medical history. In this case, the defendant doctor would have known that the patient's ovaries had been removed if she had reviewed the patient's charts before analyzing her films. The defendant doctor made this mistake not once, but twice. Salpingo-oophorectomy is surgery to remove the ovaries and fallopian tubes. If the procedure is bilateral, as it here, the surgeon removes both ovaries. This procedure is done by OB/GYNs and general surgeons. There are some medical malpractice cases involving surgeons who make mistakes during a salpingo-oophorectomy. The mistakes often involve the failure to protect adjacent organs in the operative field from injury. The placement of sutures needs to be meticulous to avoid injury to bladder, bowel, ureter or major vascular structures. Failure to understand the anatomy, protect adjacent organs, or place sutures in a structure where it should not be placed can lead to a malpractice lawsuit. If you suffered due to the negligence of a doctor, call Miller & Zois. We can help you get the compensation you deserve for the harm you have been through. We have a long history of results in medical malpractice in Maryland, earning large verdicts and settlements. Call Miller & Zois today to speak to a medical negligence attorney who can help you at 800-553-8082, or get a free online case review.